Eric on the underappreciated Woody Shaw, and Reed on the legacy of Dodd-Frank. I took the past two weeks off, in part because Reed needed to, in part because The Nation began its Summer schedule, and in part because I spent a (lovely) week as a Media Fellow at the Hoover Institute out at Stanford and I needed to give the conservatism time to wear off. So my “Think Again” columns, which I did do, are listed in reverse chronological order. I also had a letter to the editor of The Nation regarding its article on the Center for American Progress, which is behind a paywall in the current issue but I have reprinted below. The rest is pretty self-explanatory and of course Reed is back so you can just skip me if you like. Ken Silverstein, relying on anonymous sources, claims in his article on the Center for American Progress, that “Staffers were very clearly instructed to check with the think tank’s development team before writing anything that might upset contributors, I was told." I am not a staffer at the Center but I have been a senior fellow there almost since its inception. Beginning in October, 2003, I have either written or edited every iteration of the weekly “Think Again” media column for the Center’s website. At no time during the writing or editing of any these roughly 500 columns did I experience anything like what Silverstein describes above, (or anything else, for that matter, that would likely fall outside the purview of the normal editorial process at any publication, including The Nation). Indeed, I don’t even know who’s on the development team or who the Center’s contributors are and, thankfully so far, I have had no reason to care. I would have been happy to inform Silverstein of this had he contacted me in advance of publishing his article. Back to Barclay’s, the man is an entertainer. And the crowd—which at these shows is so goofy and demonstrative, it can get kind of embarrassing. Paul too, can be a little embarrassing. He keeps acting like he doesn’t do this all the time, getting all choked up and stuff and telling the same old stories about Jimi Hendrix and Eric Clapton and John and George—I don’t think he mentioned Ringo at all—but anyway: the music. Like Brian Wilson, Paul has a band that can almost perfectly reproduce the original versions. They mug quite a lot for the audience, but they do not merit individual introductions. (Barclay’s with a seating capacity of 16,000 is about as small a place as you are ever likely to see Paul these days, unless you were in the audience for the Colbert Report Wednesday night.) They opened at 8:45 with "Eight Days a Week" and then went into Junior’s Farm. It’s churlish, with a catalogue that like of McCartney to complain about what was left out. I loved "Maybe I'm Amazed,” “Band on the Run,” “All My Loving,” “We Can Work it Out,” “Back in the USSR,” (which was The Beatles paying tribute to “The Beach Boys” rip-off of Chuck Berry). We got the first ever live “For the Benefit of Mr. Kite,” according to Paul. I had mixed feelings about “Hey Jude,” because of the shlockiness of the sing along. I could not believe he left out “Get Back,” and “SPLHCB.” But hey, the final encore was of the final “Golden Slumbers” suite from Abbey Road, which was proved a stroke of genius. Seeing McCartney made me think that maybe capitalism is the only economic system that can work. When you think of the work that Paul and George and John came up with when they were still competing with one another—not only during the Beatles but in the first few years afterward—it’s two different universes. You could also attribute it to the genius of youth, but then how to explain, Dylan, Bruce, Leonard Cohen, Neil Young, etc…? But speaking of getting old, if you are a reader of mine—and are also insanely wealthy and care deeply about your personal appearance—I would go to some trouble to find out just who did the work on Paul’s face and who maintains his hair. I look older than he does. And also speaking of getting old, I recently looked over two Moody Blues DVDs. Live at the Isle of Wight 1970 and the cd/dvd Live at Montreux 1991. I was interested in the first one because I had never seen the Moodies when they were new and young. The DVD is more of a documentary than a concert though, with lots of present-day commentary about their performance there. The latter is self-explanatory and rather similar to the Red Rocks DVD that came out a few years ago, except that it’s in Montreux and comes with a CD. Even more ambitious in the old fogey department is the 4 Music DVD set from Jethro Tull, Around The World Live. Tull is always well packaged and this one comes in a nice book and is filled with previously unreleased material including the same Isle Of Wight Festival from 1970 (as in the Moodies’ show) and goes through 2005 with performances from, you guessed it, all around the world, as well as photos from Ian Anderson’s personal archive and a text on all the different shows by Joel McIver. Overall it’s about seven and a half hours of Tull. Some of it is pretty great; some of it, you really won’t mind if you sat that one out. with a surprise finish by John Legend and there were too many highlights to point to just a few. But hey, here’s they point: Look at the incredible Summerstage 2013 schedule here. This is quite a city, isn’t it. Speaking of throwbacks, Thursday night I saw the last show of what, in this humble opinion, has been the best Jazz@Lincoln Center season ever. Michael Feinstein has been curating a terrific series at the Allen Room and this one was dedicated to the big band music of the thirties when singers like Sinatra (with Tommy Dorsey), Billy Eckstine (with Basie), and Ivie Anderson (with Duke), showed the world America’s greatest invention. Inspired by Benny Goodman’s famous 1938 Carnegie concert, Thursday night, we saw Feinstein hosting Vince Giordano's Nighthawks with Wynton Marsalis (alternately channeling Armstrong and Maynard Ferguson, among others), the always adorable Nellie McKay (playing the role of Doris Day), Connie Evingson, and Sachal Vasandani also singing along. I never heard the latter two but they were both great. And what a pleasure it is to hear Feinstein whose enthusiasm is infectious and whose contextual knowledge adds immeasurably to one’s enjoyment of these shows. I learned a great deal listening to him and had about as much fun as one can have seated and fully dressed. One new set about which I’m really excited is the new release from my friends at Mosaic Records, Woody Shaw: The Complete Muse Sessions. I keep finding people who never heard of Woody, which is almost certainly attributable to the fact that he died so young. But he’s absolutely central to the history of jazz in this period and he plays like a dream. The “Muse” period is considered to be one of the three key periods in his development, and Mosaic has done its usual, beautiful job of both remastering and packaging of this nine album, 7-CD limited edition box set drawn from over a 13-year period from 1974 to 1987 after Shaw moved from San Francisco to New York. According to Michael Cuscuna, Mosaic Records founder and producer, "This was the era when Woody stepped up and became a leader." "The core of these sessions is the Woody Shaw Concert Ensemble, an expanded group with four horns and one or two percussionists. I loved this setting because it brought out Woody's incredible talents as a composer and arranger with a distinctive harmonic sense." I also wanted to give a shout-out to an unlikely place; a collection of essays about progressive rock by a bunch of writers called Yes is the Answer edited by Marc Weingarten and Tyson Cornell. There are some fancy names attached but one of the craziest essays I’ve read on anything in a long time was by a Spanish writer named Roderigo Fresan, which begins with The Arcade Fire, and talks a great deal about “A Clockwork Orange” and makes the crazy-but-possibly-true comparison that “Comfortably Numb” is to “A Day in the Life” as Nathan Zuckerman is to Holden Caufield. He wrote it in Spanish but, luckily, it was translated. I think one would like it even if one hates Yes and ELP (and never heard of Soft Machine). It is by now a truism that any action taken—or, more appropriately these days, not taken—by Congress can be best explained by understanding the influence of money. Yes, presidential campaigns now rake in nearly a billion dollars, but we often forget that for every White House race, Congress holds roughly 950 elections, the average combined total of which is now just south of $1.5 billion. Indeed, if you’re a savvy lobbyist looking to get the most bang for you buck, dumping millions into a presidential election amounts to the proverbial drop in the bucket; instead, you’ll find a much better return on your investment with a five-figure donation to a House or Senate re-election campaign. If money exerts an invisible yet unmistakable gravitational pull on everything Congress does, one can only imagine the galactic-level forces impinging on its members when they train their legislative sights on the very industry of money itself. In the aftermath of the 2008 fiscal crisis, however, a critical mass of public outrage regarding Wall Street’s reckless, arguably criminal behavior created just that very situation. Thus, the House and Senate were faced with what was no doubt the unenviable task of biting the hands that write all those precious campaign donation checks. That two years after the economic meltdown began, President Obama actually got to sign the most sweeping financial reform bill in decades truly was something of a legislative miracle. Tellingly, that word, “miracle,” is how Robert G. Kaiser, in his latest book Act of Congress: How America’s Essential Institution Works and How It Doesn’t (Knopf, $27.95), characterizes those rare moments when our modern-day Congress actually manages to legislate. Because of the book’s frustratingly vague title (and subtitle) however, one doesn’t get any sense that Kaiser has turned his full attention to the passage of the 2010 Dodd-Frank financial reform act. This ambiguity is a shame, for two reasons. For one, the book’s title fails a basic marketing test—it really doesn’t alert potentially interested readers in the book’s true narrative focus on Dodd-Frank. What’s more, while the title page is underwhelming, it is also oversold. No doubt, Kaiser presents a minutely documented, deep dive into the rarely seen legislative workings that comprised this single act of Congress. But as is also the case with undersea vehicles that explore the darkest depths of the ocean, often it’s hard to get any sense of what’s above or just beyond the particular situation or conversation Kaiser is illuminating at any given moment. On the broader, capital-H lessons of “How America’s Essential Institution Doesn’t Work,” promised in his book’s title, Kaiser doesn’t fully deliver. This authorial inconsistency—powerfully revealing on the micro level, not so much on the meta—perhaps shouldn’t be that surprising. Kaiser is a 50-year veteran of the Washington Post and his book routinely feels a lot like a prodigiously proportioned process piece. (In the Acknowledgments, Kaiser notes that he and Len Downie, the paper’s longtime, now retired, Executive Editor, were summer interns together in 1964.) There’s plenty of focus on the who, the what, the where, the when, and the how, in other words, but not near enough discussion of the why. Indeed, if there was one term to describe Kaiser’s effort here it would probably be Woodwardian, with all the attendant plusses and, more importantly, minuses that his Post colleague’s trademark, all-about-the-access reporting brings with it. Indeed, the book’s limited analytical scope is evident early on, when recounting a January 2009 Congressional hearing. There, Kaiser highlights Rep. Bill Clay’s suggestion of directly injecting taxpayer money into private retirement accounts. “Someone who understood the vagaries of the financial markets would not have made this suggestion,” Kaiser scolds. But this attitude tellingly reveals his (and the Beltway media’s) limited willingness to ponder solutions outside of the narrow bounds of what interests the powerful. In actuality, many respected economists were advocating for exactly that kind of citizen-targeted, “helicopter drop” bailout of ordinary Americans. Such a plan would stimulate the economy more quickly and more directly than routing government cash through big banks that might choose to hoard the capital rather than loan it out—which, by the way, is exactly what happened. But no, Clay’s idea, Kaiser sniffs, wasn’t a “serious” suggestion. Time and again, Kaiser’s book becomes something of a case study of the deferential nature of the Washington press corps. Authority and expertise routinely draw praise and respect, radical ideas not so much. Thus, the book tut-tuts the populist tone of a Congressional hearing on the AIG bailout and dismisses the questioning of Treasury Secretary Timothy Geithner and Federal Reserve Chairman Ben Bernanke for lacking sophistication. “They were the pros; the skeptical members challenging them, from both parties, looked like amateurs,” he writes. Yet Kaiser can’t seem to make the larger point here, that the incomprehensible and impenetrable nature of the financial industry’s products and services were precisely the problem. The outrage should not have been that Congress was too dumb to understand collateralized debt obligations, it’s that the financial industry that created CDO’s was too dumb to understand them. Kaiser’s sympathetic in-the-room journalistic style, mirroring Woodward’s, manifests itself throughout the book. Thus, his subject’s preferences and biases quickly become adopted as his own. So, if Barney Frank, who gets the humorously rumpled hero treatment from Kaiser, dismisses something as unhelpful for his bill, the book becomes captive to the same logic. Likewise, anyone outside of his primary reporting bubble tends to get much more critical treatment. For example, in the chapter on the early House drafting of the bill, Frank acknowledges some anxiety that Speaker Pelosi’s enthusiasm for a Congressional investigation into the financial crisis would distract from his legislative efforts. This is an eminently reasonable position for a committee chairman to take, of course. But Kaiser’s empathy notably does not extend to the Speaker, who has a larger constituency and greater moral responsibilities to consider. Instead, the book makes a point of rather snidely dismissing Pelosi’s motivations as counterproductive and basically accuses her of shameless political grandstanding. But Pelosi’s reading of public sentiment was in fact dead on, as just weeks after her initial call for a reprise of the 1930s Pecora Commission, a Celinda Lake poll found 71 percent of Americans agreed with her that Congress should look into Wall Street’s role in the manufacturing the Great Recession. Likewise, when the House bill finally moved to the Rules Committee, Frank wanted to encourage amendments to get buy-in from MOCs. Pelosi, understandably wary of a runaway legislative process, instead favored strict limits on the number of amendments on offer, however. Again, Kaiser’s take falls neatly in line with Frank’s, and he diagnoses Pelosi’s firm control over the bill’s rollout as timidity on her part, and proof of an “insecurity complex.” Perhaps Kaiser should ask current Speaker John Boehner if he wouldn’t trade for a version of Pelosi’s legislative efficiency in order to rein in his increasingly hard-to-control House GOP caucus. This same Republican intransigence and disarray stands as a major subtext of Kaiser’s book as well. From the outset, the GOP minorities in the House and Senate were fighting a holding action of least-worst options when it came to financial reform. And though a handful of Republicans made an honest effort at bipartisan compromise—most notably, Tennessee Senator Bob Corker—the obstructionist mindset of GOP leadership slowly but surely reeled them all in. Though reform champion Senator Chris Dodd ended up incorporating some of these conservative ideas into his final version of a reform bill, it’s telling that all his months of reaching across the aisle did not earn him a single GOP vote when it came for final passage. Instead, Dodd watched as Republicans duplicitously deployed dishonest talking points about financial reform as a lever to pry campaign cash out of both Tea Partiers and Big Business. To the former, the GOP brazenly lambasted the bill as yet another “bailout” and a perpetuation of “Too Big To Fail”—two buzzwords conservative pollster Frank Luntz found resonated with the public. (To be fair, some of the fears of TBTF have proven true.) To the latter, Republicans ginned up fears of the impending reform as “job-killing” regulation tantamount to the end of capitalism, frightening millions in political donations out of the pockets of worried Wall Street executives. Though Dodd-Frank was the undoubtedly the most comprehensive piece of financial legislation in decades, this says more about how out of control the industry was than it does the true scope of the bill, which was much more prosaic and scaled-back than opponents and even supporters made it sound. From the very beginning, the impact of money in politics played a big role in influencing the bill’s many compromises. For instance, as the Democrats began staking out the boundaries of financial reform in early 2009, many experts recommended that it merge the two main regulatory bodies, the Commodity Futures Trading Commission (CFTC) and Securities and Exchange Commission (SEC). But because this consolidation would correspondingly shrink Capitol Hill oversight from four to two Congressional committees—meaning lots of MOCs on the House and Senate Agriculture Committees stood to lose access to their Wall Street campaign gravy train—the idea was scrapped as too controversial for Congress to approve. Good money trumped good policy. In the end, the major legislative battles were joined over three aspects of financial reform—the Volcker Rule on bank investing, regulating the derivatives market, and the creation of a new independent watchdog Consumer Financial Protection Agency. Tellingly, on all three of these issues, moneyed interests from within both parties again forced compromises into the final version of Dodd-Frank. 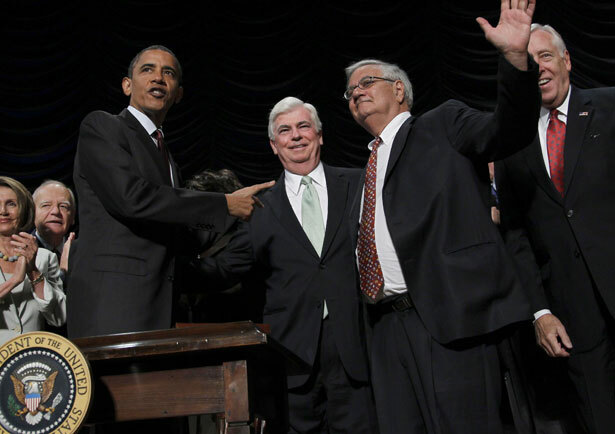 And though all three survived and were part of the final conference bill President Obama signed three years ago, the victory that Kaiser portrays Dodd-Frank to be is increasingly a Pyrrhic one. That’s because the end of Kaiser’s book was by no means the end of the story of the financial reform fight. Though he concludes the book with a short chapter replete with skepticism about Congress’s capability to solve our problems, Kaiser doesn’t devote much rhetorical real estate to studying the growing influence of money on our legislative branch wrought by Citizens United. And in a sentimental turn, he stands fast to the idea that with financial reform, “the big banks got nothing.” Yet this dubious stance has been rendered near laughable by now, as the big bank accounts of the forces against reform have been conducting an all-out assault since the day Dodd-Frank became law. And as Rolling Stone’s Matt Taibbi notes, those forces are winning. "There is only a tiny attentive audience for what goes on in Congress—perhaps ten or fifteen thousand professors, journalists, lobbyists, government officials, and lawyers, in a country of more than 300 million. "The members of that tiny informed audience, like members of the House and Senate, tend to accept the mumbo jumbo as just the nature of the beast—standard operating obfuscations. So the House and Senate go on doing business in ways that citizens might disapprove of strongly, if they really understood what was happening.…They just play the old games behind the curtain. They know that almost no one is paying close attention." As a body that now openly trades favors to the highest bidder without fear of much in the way of press scrutiny or public outrage, it’s becoming more and more difficult to distinguish our broken Congress from the world’s oldest profession. And until we finally find a way to excise money from politics, it's we the people will continue to get screwed over by the transactions of Congress.